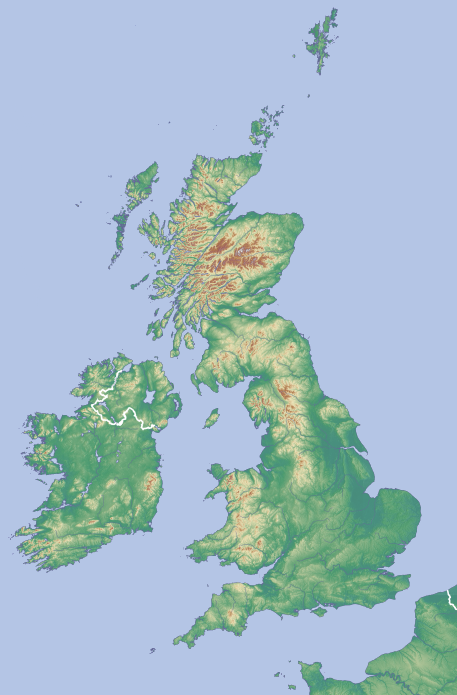 There are many recognised lists of hills and mountains in Britain and Ireland - all the well-known lists and a good many of the less popular ones are covered here. Click on the required list name on the adjacent map, or use the mountain search facility. You can use this website to log your own progress against these lists - simply register a Username and Password (free), and follow the instructions on the registry page. Please note that inclusion of a hill on this site does not necessarily mean it is accessible. In particular, some hill summits are on land where there is no public right of way nor open access. Permission should be sought from the landowner where access to a hill is through private land. Note that access rights in Scotland differ from the rest of the UK. You can view a log of recent changes to the DoBIH - some of these changes are applied to this website before they are generally released on DoBIH. Refer to the Database Notes section of the DoBIH website (www.hills-database.co.uk) for version release notes and other changes to the database. Please contact me with your comments or suggestions about this website. 10th Apr 2019 Editorial feedback on the results of the recent DoBIH survey now available, see Feedback. 1st Apr 2019 New county (UA) Bournemouth, Christchurch and Poole formed from defunct Bournemouth and Poole UAs and part of Dorset. 4 hills moved to the new UA, with hill 5530 Corfe Hills as the county top. 1 new Subsimm and 2 deletions. 1 SIB with significant summit relocation. 19th Mar 2019 2 Tump deletions (Cumbria, Rochdale). 2 Tumps (including 1 Marilyn/Simm/Hewitt/Nuttall) with significant summit relocation. 16th Mar 2019 4 new Tumps added (Devon, Northumberland, Highland, Cornwall). 1 Tump reinstated (Neath Port Talbot). 1 Tump deletion (Neath Port Talbot). 2 Tumps with significant summit relocation. 22nd Feb 2019 Switched back to using OS Open Space as mapping source on most search and hill details pages. Bing Maps has annual limitations on free usage so needs to be used more sparingly. 16th Jan 2019 3 new Tumps added (Shropshire, Northumberland, Nottinghamshire). 994 Carn Breac (Ma,Hu,Tu,Sim,G) significant summit relocation. 7th Jan 2019 4 new Tumps and 1 reinstatement (Argyll and Bute, Northumberland, West Sussex, North Yorkshire, Highland). 1 Tump deletion (West Sussex). 5 hills classified as Other Lists (Yeamans). 1st Jan 2019 Now using Bing Maps as mapping source on search and hill details pages. Please let me know if you spot any problems. 21st Dec 2018 Data is aligned with v16.2 of the Database of British and Irish Hills (DoBIH). For further details, see the revision history. 20th Dec 2018 1 Hump deletion. 18th Dec 2018 5463 Boring Field County Top with significant summit relocation. 8th Dec 2018 1 Tump/Simm/Hewitt added (Gwynedd). 1 Tump/Simm/Graham Top added (Argyll and Bute). 1 Tump added (Argyll and Bute). 2 Tumps with significant summit relocations (Cornwall,Caerphilly/Merthyr Tydfil). 2 Hump promotions and 2 demotions. 1 Subsimm added and 1 deleted. 1 hill transferred from Donald Dewey to Graham Top. 3 hills on Bridge list transferred to different hill locations. 11th Nov 2018 Manchester UA top significant summit relocation. 19445 Clytiau-poethion replaces 14812 Bryn Glyn Uchaf (which also has a significant summit relocation) as Tump (Conwy). 19452 Iolyn Park replaces 7514 as Tump/sHu (Conwy). 2 new Tumps added (Jersey, Carmarthenshire). 2 Tumps (including 1 Hump) with significant summit relocation. 7668 Mynydd Gelliwastad demoted from Humps (with a significant summit relocation). 3 Tump deletions (Carmarthenshire, Cornwall). 19th Oct 2018 1 new Tump added (Dumfries and Galloway). 2 Tump deletions (Scottish Borders, Bath and NE Somerset). 5th Oct 2018 Important I have had a number of reports recently from people who have received troubling emails where the sender claims to have hacked into their email or their computer, and quoting their hill-bagging password as evidence of their claim. I believe the sender has obtained a list of email address and passwords from hill-bagging at some time in the past. This must have been over 2 years ago, because at that time I became more aware of security issues and took steps to encrypt the email addresses on the database and "hash" the passwords (which means the passwords can't be decrypted even if you have the hash key). Also at that time I stopped sending automated emails confirming the username and password when people registered on hill-bagging, because someone pointed out that sending email and password details by plain email was not secure. I am sorry if you have been the recipient of an unpleasant email. If you registered on hill-bagging more than two years ago I recommend that you change your password on hill-bagging if you have not recently done so, and on any other website/system where you have used the same login credentials. 1st Oct 2018 24 new Tumps added - mainly sea stacks (Neath Port Talbot, Pembrokeshire, Cornwall, Devon, Orkney Islands, Shetland Islands, Western Isles, Highland, Argyll and Bute, Moray). 2 Tump deletions (Carmarthenshire, Pembrokeshire). 17th Sep 2018 4 Hump promotions. 1 promotion and 1 deletion for Simm/Hew/Tump (Cumbria). Brock Crags separate summit added for Subdodd. 26th Aug 2018 2 new Tumps added (Cornwall, Na h-Eileanan Siar [Western Isles]). 11th Aug 2018 2343 Miller Moss [Little Lingy Hill] promoted to Nuttalls. 3rd Aug 2018 Data is aligned with v16.1 of the Database of British and Irish Hills (DoBIH). For further details, see the revision history. 2nd Aug 2018 1117 Beinn Dearg promoted to Marilyn. 5721 Creag na h-Iolaire promoted to Tump/Simm/CT. 1 new Tump added (Isle of Man seastack). 2 Subsimms added (Stirling, Highland). 1 hill changed from CT to GT. 1 Hump/Tump with significant summit relocation. 22nd Jul 2018 2 new Tumps added (Gwynedd). 16th Jul 2018 1 Simm/Tump promotion and 1 Simm/Tump/Hewitt deletion (Powys, Highland). 1 Tump deletion (Shetland Islands). 21st Jun 2018 4 new Tumps added (Isle of Man, Highland). 1 Tump with significant summit relocation. One Corbett Top to Murdo transfer. Various sub-list additions and deletions. 7th Jun 2018 4 new Tumps added including 1 new Simm (Argyll and Bute, Highland, Cumbria). 1 SIB added (Yorkshire E Riding). 15th May 2018 6 new Tumps added (Dumfries and Galloway, Doncaster, Northumberland, Highland). 2499 Silver How promoted to Tump (Cumbria). 2 Tump deletions (North Yorkshire, Staffordshire). 1980 Moel Siabod no longer a P600. 22nd Apr 2018 1 new Tump added (Highland). 1 Dodd and 1 Subhump deletion. Website is printer friendly - if you print any page on the website using your browser print button, it will print out correctly with appropriate page breaks, and without the navigation bar.